Please note: The Fourth Musketeer will feature an interview with Odette's Secrets author Maryann Macdonald on April 25. World War II seems to supply authors, whether those for children or adults, with an inexhaustible supply of true stories for inspiration. 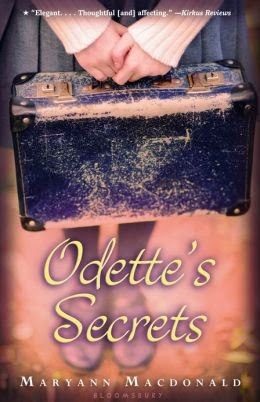 Author Maryann Macdonald turns to historical fiction in her new novel, Odette's Secrets, about a young Jewish girl in Paris during the Nazi Occupation. Odette's story is told in spare free verse; we meet her Polish-Jewish parents who have immigrated to Paris with their only daughter Odette. Odette is beloved by her gentile godmother, the concierge at her building, and has a comfortable existence until her father joins the French military, is taken prisoner by the Germans, and conditions began to worsen considerably for the Jewish population of Paris. Soon the round-ups of foreign-born Jews begin, destined to be shipped off to the East. Odette's mother, realizing the danger, makes a plan for her daughter and the daughters of other friends to go stay with family friends in the Vendee, outside of Nazi-occupied France, where she will be in safely in the countryside with plenty to eat. There's one wrinkle--Odette must forget that she's a Jew. She must blend in perfectly with the village children, learn how to cross herself, say Catholic prayers, attend mass, eat pork, in other words, do nothing that could distinguish her from other children in the village. She becomes very good at keeping secrets--even from her closest friends. But when her mother flees Paris to join her, suspicion follows them just the same. Can they stay safe? And what will happen after the war ends? Will her father and other relatives find them back in Paris? This is a moving, small novel that can be read quickly but delves into real issues of prejudice, bravery, and how ordinary children can survive in dangerous and extraordinary times This novel is inspired by the life of the real Odette Myers, a story the author discovered while doing research in a Paris library; she was helped in this project by Odette's son, Daniel, who shared family photos and experiences. Highly recommended. Award-winning Australian author Sonya Hartnett returns to World War II in her latest historical novel for middle grade readers. 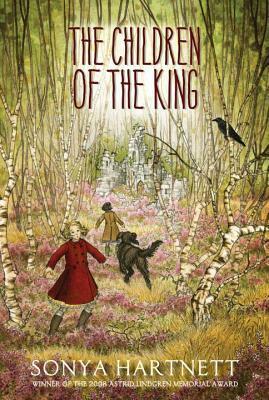 The Children of the King blends a paranormal ghost story with historical fiction; it takes place in England at the beginning of the Second World War, and the novel begins with the young and somewhat spoiled Cecily and her older brother Jemmy moving from their comfortable upper-class existence in London to the equally comfortable country home of their uncle, to be safe from bombs that are expected to soon begin falling on London. Their father, who appears to be someone important to the war effort, is left behind in London. Unlike other child evacuees, they are fortunate to be with their mother while other evacuees are taken in by total strangers. Cecily begs her mother for them to take in an evacuee too, and she chooses a young girl close to her own age named May. Cecily expects the younger May to be her little pet, obeying her in everything. May, however, has a mind of her own, and soon is off exploring the countryside, where she discovers the ruins of an old castle. The castle is inhabited by two young brothers, dressed in fancy, old-fashioned clothes--are they evacuees who have run away from their new home? Or could they be something more amazing--and be somehow connected with the story that Uncle Peregrine tells them (and the reader) in bits and pieces? This story is the history of Richard III and the nephews he imprisoned in the Tower of London. The young princes' story is interwoven with that of the three modern children, all of whom are coping with the war in their own way. Hartnett does not spare the reader from some very vivid descriptions of the London bombings, which are contrasted with the peaceful existence in the countryside. This is a beautiful and touching war story, with a ghost story woven in for good measure. As you might expect, the two stories intersect in a magical way toward the end of the novel (no spoilers). An afterword with some more information about the young princes in the tower and the London Blitz might have been a good addition, to provide some historical facts and context to go with the uncle's tales. Patricia Polacco is one of our great contemporary picture book authors, and specializes in picture books with serious content such as racism, disabilities, and even cancer, making them appropriate for older elementary school readers. In her newest book, which fits in perfectly for Women's History Month, she explores the girlhood of one of the most famous female figures of the 19th century, Clara Barton. Clara was the fifth child to be born into the Barton family in Massachusetts, and with her mother in ill health, she was virtually raised by her siblings, particularly her older brother Davie, whom she adored. Joyous illustrations in Polacco's signature style show Davie showing Clara how to ride on a horse while she flings her arms in the air in delight. She helped Davie with his chores on the farm, and had an immediate affinity for nature and particularly with animals. But she had a speech impediment that made her shy and afraid of people; because no one understood this sort of problem in that day, her older sister punished her for not speaking correctly. School was a nightmare for her, and finally her parents agreed she could be taught at home. Even as a young girl, Clara had healing hands and neighbors let her treat their farm animals. When Clara's beloved brother Davie breaks both legs in an accident, she becomes his nurse and with her coaxing, urges him back to health, giving him the courage to try to walk again. This is a touching introduction to a famous woman from history from a unique perspective--her love for her brother. Children will be able to easily identify with Clara's inhibitions, her love for nature, and animals, and her desire to help her brother heal. An author's note tells more about Barton's career as a teacher, nurse, and founder of the American Red Cross. 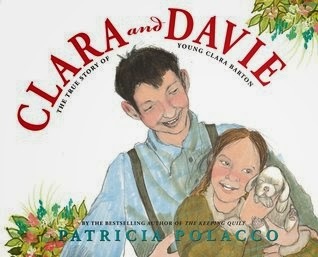 In an intriguing historical twist, we learn that Patricia Polacco herself is distantly related to Clara Barton, on her mother's side of the family, and they own a vase which is reputed to once have belonged to Clara Barton herself. See Mary Ann Scheuer and Louise Capizzio's post on Kidlit Celebrates Women's History Month for more great suggestions on how to pair this book with other resources on Clara Barton. In this picture book for older readers. Tracey Fern tells the little-known story of Eleanor Prentiss, an extraordinary woman who not only navigated a clipper ship but also set a record for the fastest time from New York to San Francisco, navigating around Cape Horn in a record-breaking 89 days, 21 hours. If you're an avid movie-goer like I am, you may have seen the two major films this year set at sea, Captain Phillips and All is Lost. Such movies always make me think about the "olden days," when sailors navigated by the stars and a sextant. Doesn't it seem incredible? Even more incredible (but true) is the life of Eleanor Prentiss, born the daughter of a sea captain in 1814 and taught everything about ships, including navigation, by her father, perhaps because he had no sons. Certainly this education was highly unusual for a 19th century girl. The sea was in Ellen's blood, and, not surprisingly, she married a sea captain, who took her along on his merchant ships as her navigator. When Ellen's husband was given command of a new, super-fast clipper ship, Ellen seized the opportunity to get as quickly as possible from New York to the tip of South America to San Francisco and the Gold Rush. Speed was of the essence for those looking for riches in the gold fields of California. The book portrays the considerable dangers of the voyage, including a period when the ship was becalmed (no wind, no movement!) and also the perilous stormy waters of the Cape. Fern does a terrific job of capturing the excitement of the journey, and Ellen's triumph when she sets a world record for the fastest time for this 15,000 mile voyage. 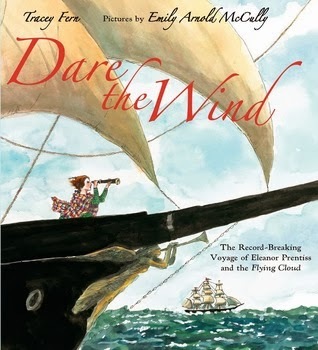 The book is greatly enhanced by the beautiful water-color paintings of Caldecott-winning artist Emily Arnold McCully. The seascapes, and particularly the scenes of storms, are particularly effective. Back matter includes an author's note with further historical information, and suggestions for further reading, both books and websites, a glossary, and end pages which show a map of the Flying Cloud's 1851 Voyage. Highly recommended for Women's History Month and for those looking for stories of strong, heroic women and girls! 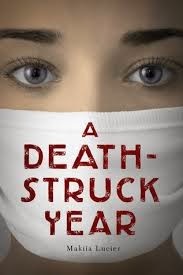 A Death-Struck Year is an excellent historical novel for teens from debut author Makiia Lucier about the 1918 flu epidemic, which continues to fascinate and frighten into the 21st century. As the novel opens, we meet Cleo, a 17-year old orphan who's being raised by her older brother and his wife. She's a student at a ritzy girls' boarding school in Portland when the flu epidemic begins in the United States, but despite the dire news reports about the epidemic striking East Coast cities, she feels safe enough 3000 miles away in Portland. But when a train filled with soldiers coming home from "The Great War" brings the epidemic to the West Coast, the influenza quickly spreads and Cleo's school is shut down, with girls that have no family at home quarantined at the school. Telling no one that her brother and his wife are out of town, Cleo escapes to her own home, where she lives alone--just for a few days, she thinks, until their housekeeper returns from a trip out of town. But when the epidemic strikes in force, Cleo decides to volunteer with the Red Cross, putting herself in harms' way but feeling a strong pull to help out in some way. This being a YA novel, she meets a handsome young medical student with whom she falls in love. The Red Cross volunteers are not immune to the flu epidemic, despite wearing masks (which did little if nothing to protect them). What will happen to Cleo and her new brave friends? This is a well-researched and compelling historical novel that will appeal to teens 13 and up. It paints a realistic view of the tragedy of the 1918 flu, which struck particularly hard at healthy young people, as well as children and the elderly. The author does not try to spare the reader's feelings, and be prepared with some tissues to deal with the many tragedies described. Highly recommended, particularly for those teen readers looking beyond the plethora of paranormal and dystopian novels that have been flooding the YA market in the last few years. A historical note provides further background about the flu epidemic, particularly in the Pacific Northwest. Women's History Month began on Saturday, March 1. 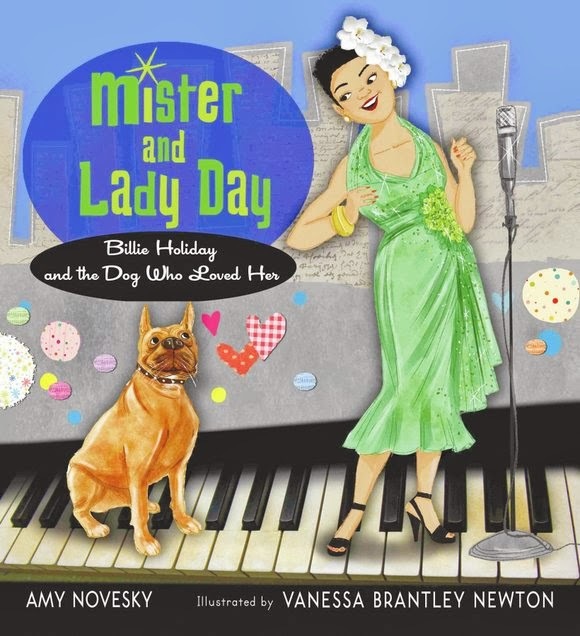 You can learn more about outstanding children's books on women's history by following the 4th annual group blog which I co-organize with fellow blogger/librarian Lisa Taylor, Kidlit Celebrates Women's History Month, Once again we will feature posts from distinguished authors, illustrators, librarians and bloggers, and we invite you to participate in the conversation. This year's contributors will include authors Tonya Bolden, Sandra Neil Wallace and Gretchen Woelfie, librarian Penny Peck, and many others. 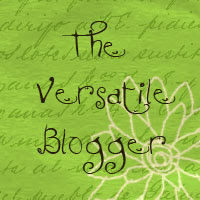 In addition to the blog, you can also access our content on Facebook, Twitter, and Pinterest. While new content is published only in March, the blog is available all year long as a resource for librarians, parents, and educators. Please join us in our 4th annual celebration! Here at the Fourth Musketeer I will also be highlighting books about women in history this month. 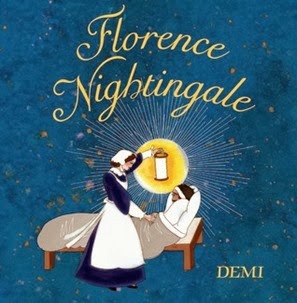 Today I will be reviewing Demi's newest book on Florence Nightingale. Demi has published over 150 books during her long career, many of them large format biographical picture books aimed at elementary school-aged students. In addition to their informative text, Demi's biographies showcase her unique artistic style, which features a strong Asian influence, traditional materials, intricate patterns, and vibrant, glowing colors. When I was a girl in the 1960's and '70's, Florence Nightingale would have been one of the only women from history you would have been likely to find a book on in the children's biography section of your local library, although I would be reasonably certain that I could not have found a biography as beautifully illustrated as this new one. On the end pages and title page, we see Florence as the iconic Lady of the Lamp. The book unfolds in a traditional linear narrative, beginning with Florence's birth and girlhood. She was born into a very wealthy British family, where she had all the advantages of an upper class upbringing. But her interest in nursing and helping others began at a young age; Demi shows us Florence as a little girl playing hospital with her dolls. Her interest in nursing intensified on a family trip to the Continent when in addition to seeing the tourist sights, she visited hospitals and charities. Her parents were opposed to her becoming a nurse, but eventually relented when they saw her commitment. Demi's text and artwork show Florence's career progressing from working at a hospital for indigent women to her groundbreaking work nursing soldiers in the Crimean War, where she arranged for patients to get healthy food and water and stressed the need for cleanliness. We see Florence wandering the wards at night with her lantern, earning her nickname, The Lady with the Lamp. Florence worked herself to exhaustion and suffered ill health later in her life. Nonetheless, she continued to work for the poor and downtrodden in society, and inspired the founding of the International Red Cross. Demi's book not only provides an outline of Florence Nightingale's remarkable life but also considers her legacy as an extraordinary woman in history. Back matter includes a timeline and suggestions for further reading. This slim but powerful volume is a must for school and public libraries.